KNAC.COM - News - Singer MIKE HOWE Returns To METAL CHURCH! Singer MIKE HOWE Returns To METAL CHURCH! 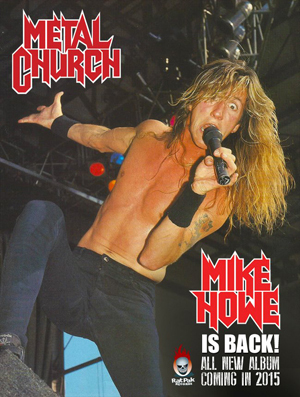 Legendary front-man Mike Howe returns to METAL CHURCH! In the summer of 2014 the band suddenly found themselves in need of a new singer. As fate would have it, Kurdt was already in talks with Mike for another project that he was working on with SAXON drummer Nigel Glockler, so he decided to ask Mike to rejoin METAL CHURCH. Mike agreed, but true to form, didn’t want to make it official until he knew for sure that the integrity of the new material was there. Mike Howe originally joined METAL CHURCH in the late 80’s and released 3 albums with the band: The Human Factor, Blessing In Disguise and Hanging In The Balance. Mike was also the face of popular music videos like “Date With Poverty” and “Badlands” that aired during MTV’s heyday”.